Who are the Theotokos and St. John? The Orthodox Church remembers the life of the Theotokos with several feast days. The Liturgical year begins and ends with the feast days of the Theotokos. wonder working Icons of the Theotokos also have their own feast days. 1. The Nativity of the Theotokos is celebrated on September 8. 2. The Presentation of the Theotokos into the Temple is celebrated on November 21. 3. The Annunciation to the Theotokos is celebrated on March 25. 4. The Dormition of the Theotokos (Falling Asleep) of the Theotokos is celebrated on August 15. Of these, the Annunciation and the Dormition are the most festal. As a title for the Virgin Mary, Theotokos was recognized by the Orthodox Church at Third Ecumenical Council held at Ephesus in 431. It had already been in use for some time in the devotional and liturgical life of the Church. The theological significance of the title is to emphasize that Mary’s son, Jesus, is fully God, as well as fully human, and that Jesus’ two natures (divine and human) were united in a single Person of the Trinity. The competing view at that council was that Mary should be called Christotokos instead, meaning “Birth-giver to Christ.” This was the view advocated by Nestorius, then Patriarch of Constantinople. The intent behind calling her Christotokos was to restrict her role to be only the mother of “Christ’s humanity” and not his divine nature. Nestorius’ view was anathematized by the Council as heresy, (see Nestorianism), since it was considered to be dividing Jesus into two distinct persons, one who was Son of Mary, and another, the divine nature, who was not. It was defined that although Jesus has two natures, human and divine, these are eternally united in one personhood. Because Mary is the mother of God the Son, she is therefore duly entitled Theotokos. The title “Theotokos” continues to be used frequently in the hymns of the Orthodox Church. While some languages used by various Orthodox churches often have a single native word for Theotokos, it gets translated into English in a number of ways. The most common is Mother of God, though God-bearer and Birth-giver to God are also fairly common. There are difficulties with all these translations, however. The most literally correct one is Birth-giver to God, though God-bearer comes close. Theophoros (Θεοφορος) is the Greek term usually and more correctly translated as God-bearer, so using God-bearer for Theotokos in some sense “orphans” Theophoros when it comes time to translate that term (for St. Ignatius of Antioch, for instance). The main difficulties with both these translations for Theotokos is that they are a bit awkward and difficult to sing. The most popular translation, Mother of God, is accurate to a point, but the difficulty with that one is that Mother of God is the literal translation of another Greek phrase which is found on nearly all icons of the Theotokos: Μητηρ Θεου (Meter Theou), usually in the standard iconographic abbreviation of ΜΡ ΘΥ. Additionally, a number of hymns employ both Theotokos and Meter Theou—translating both as Mother of God can yield some rather nonsensical language, and it destroys the distinction that the hymnographer intended. The usage that seems to be dominant in English-speaking Orthodox churches in North America is to adopt the original term itself into English (something English speakers have traditionally done with foreign words almost since the earliest known history of the language), transliterating it simply as Theotokos. British usage gives preference to translating Theotokos as Mother of God. The title Our All-holy, immaculate, most blessed and glorified Lady, the Theotokos and Ever-Virgin Mary (Greek: Τῆς Παναγίας, ἀχράντου, ὑπερευλογημένης, ἐνδόξου, δεσποίνης ἡμῶν Θεοτόκου καὶ ἀειπαρθένου Μαρίας) is often used in Orthodox services when Mary is mentioned. The title Panagia (all-holy) never was a subject of dogmatic definition, but it is accepted and used by all Orthodox. This is because she is the supreme example of cooperation between God and the free will of man. “Behold the handmaid of the Lord; be it unto me according to your word” (Luke 1:38). Sometimes Mary is called the New Eve because her obedient submission to the will of God offset Eve’s disobedience in Paradise. The Orthodox Church calls Mary “immaculate,” “pure,” or “spotless” (achrantos in Greek). Some Orthodox state that she was free from actual sin, some say she never sinned, and others just say she died sinless. As for original sin and the Roman Catholic doctrine of the Immaculate Conception, the Orthodox Church has never made any formal and definitive pronouncement on the subject. The majority of Orthodox have rejected the doctrine, for it seems to separate Mary from the rest of mankind, putting her in a completely different class from all the other righteous men and women of the Old Testament. It is important that Mary was the same as all mankind so that all Christians can follow her example and submit to God’s will. Mary was born a sinner, a human with full human nature. Mary’s Son, Jesus the Christ, took flesh from her. So as Son of God, He assumed fallen human nature from her and redeemed humanity by His Crucifixion and Resurrection. Also, the original doctrine of the Immaculate Conception (1869) implies an understanding of original sin not held by the Orthodox Church. The Orthodox Church honors the Mother of God on account of the Son. St. Cyril of Alexandria, along with the Fathers of the Council of Ephesus, insisted on calling Mary “Theotokos” not just to glorify her, but to safeguard a right doctrine of Christ’s person, the Incarnation. Orthodox Christians feel that one cannot really believe in the Incarnation and not honor Mary. See below. The Orthodox Church honors Mary as “Ever Virgin.” In iconography, her virginity before, during, and after the birth of Christ is represented by three stars on her shoulders and forehead. One of the more puzzling traditions regarding the Theotokos for modern Christians is the teaching that she is Ever-Virgin, that is, that she remained a virgin before, during, and eternally after the birth of Jesus Christ. That the Holy Virgin Mary is Ever-Virgin (Aeiparthenos) is not to elevate her to some special status or to incite us to worship the creature rather than the Creator. Rather, it is an affirmation of who Christ Jesus is. Because He has chosen her to be his mother, to conceive Him, to give flesh to Him, to give birth to Him, we understand her as a finite dwelling place of the infinite God. Thus, because she is in this sense this new Holy of Holies, her ever-virginity is a natural characteristic of such an awesome reality. Elizabeth greets Mary the same way the Ark of the Covenant was greeted. The entrance of the Ark and the entrance of Mary are seen then as blessing an entire household. Like Obededom’s household was blessed, so Elizabeth sees her household as blessed. Laurentin goes on to talk about how both David and Elizabeth react with awe. “How shall the Ark of the Lord come to me?” David says in II Samuel 6:9. And likewise Elizabeth says, “Why should the mother of the Lord come to me?” The Ark of the Covenant and the Mother of our Lord are in a sense two ways of looking at the same reality which is becoming clearer and more personal with Our Lady. Then finally, the Ark of the Covenant and Mary both remain in the respective houses for three months, II Samuel 6:11 and Luke 1:56. In Luke 1 and 2 we have the annunciation of Gabriel to Zachariah and six months later the annunciation by Gabriel to Mary, then nine months later Jesus is born, and thirty days later He is presented in the temple. You add up 180 days in the six months, 270 days in the nine months, and the 40 days in the presentation and it adds up to 490, which is a very rare number that is found in one of the most memorable prophecies in the OT, Daniel 9. . . . Luke is once again giving a surplus value, a surplus meaning to those who are really willing to dig deep into the text to see all of the inspired meanings behind what God has done to inaugurate the New Covenant salvation in Christ and in His Blessed Mother. This is the Ark of the Covenant. Now let’s go back and conclude our time in Revelation 11 and 12. We have Mary the Ark of the Covenant. We have Mary the true tabernacle. We have in Mary a figure for the New Jerusalem because at the end of Revelation, how is the New Jerusalem described? As being a bride that is pure and yet also being a mother of God’s children Well, how is it that you could be at the same time virginally pure and maternally fruitful? It seems impossible in human nature, but not for Mary, not only in mothering Jesus, but in John 19 at the cross and also in Revelation 12 where we read at the very end of the chapter, verse 17, we discover that Mary becomes by grace the mother of all God’s children. How is it that our Lord would have brothers? Many look at the story of Ss. Mary and Joseph and see a young couple about to embark on their married life together, but Church tradition holds differently. St. Joseph was a much older man, a widower, and had children by his previous marriage, thus his sons were in some sense Christ’s step-brothers, and their being older than Jesus can also account for some of the way he is treated by them as being the baby of the family, somewhat out of his mind. Joseph takes in Mary as something like his ward, because in leaving her life as a Temple virgin, she could not go out into the world alone (cf. Protevangelion of James). That is why Joseph, a righteous, respected man, was chosen to take her in. His being much older than she also accounts for the notion that they should have had relations—she had already dedicated herself to a life of virginity, whereas he was a much older man who had already had his children and whose wife had died. Another possible understanding is that these “brothers” of our Lord were his cousins—St. Jerome holds this view, that these were the children of St. Joseph’s brother Cleopas, who had died and left his children and widow in Joseph’s care, according to Jewish custom. Additionally, both the Hebrew and Greek terms for “brother” are often used to refer to relatives who are not necessarily what we in English would term “brothers,” i.e., perhaps a cousin or an uncle, or some other relative. For example, Abraham and Lot are called adelphoi in Gen. 14:14 in the Septuagint (the Greek translation of the OT used by the Apostles), though they are certainly not what we would call “brothers.” Jacob and Laban are also called “brothers” (Gen. 29:15), though Laban would have been Jacob’s uncle. In any event, the words do not mean the precise thing that the modern English “brother” does. Beyond that, it is nowhere to be found in Scripture that any man other than the God-man Jesus Christ is called the child of Mary. Some would cite the use of the “until” in Scripture (“…and he knew her not until (Greek eos) her having brought forth her firstborn son…” (Matthew 1:25; Luke 2:7)) to indicate that after she gave birth to the God-man, that St. Joseph then “knew” her maritally. Again, this is a translation problem. Another testimony from Scripture is that on the cross, our Lord gave his holy mother into the care of the Apostle John (John 19:26). This might seem a merely practical thing to do, but if we recall the Mosaic Law would have dictated that she be given into the care of other natural children, since her firstborn son was dying. Christ, who kept the Law perfectly, would not have violated it in any detail, and so when he gave his mother to the apostle to look after, he did so only because she had no other children who could take her in, St. Joseph having long since passed away. The Church continued to call the Theotokos the “Virgin” even after the time when she supposedly would have had other children, as some say. It would be a rather odd thing to keep calling a woman “the Virgin” and even “Ever-Virgin” when one was standing next to her other offspring in Church. Additionally, throughout the earliest liturgies of the Church, she is continually called “Ever-Virgin.” One can also find references to her ever-virginity in the Fathers’ writings, such as in those of Peter of Alexandria, Epiphanius, Athanasius, Didymus the Blind, Jerome, Cyril of Alexandria, Leo, Sophronius I of Jerusalem, John of Damascus, John Cassian, Ephrem of Syria, and the capitula of the II Council of Constantinople in 553 A.D. (In short, nearly everywhere.) One such example is in St. Ambrose of Milan (4th century): “The virgin did not seek the consolation of bearing another child” (See Letter 63; NPNF v. 10, p. 473). There are many other such quotations. Anyone familiar with the writings of the Church Fathers will see her being called “the Virgin” and “Ever-Virgin” frequently. Hippolytus was a scholar, bishop, and martyr, who lived in or near Rome and wrote in Greek; he was martyred in A.D. 235. He is considered to be one of the most important witnesses as to how the early church worshipped. But the pious confession of the believer is that, with a view to our salvation, . . . the Creator of all things incorporated with Himself a rational soul and a sensible body from the all-holy Mary, ever-virgin, by an undefiled conception, without conversion, and was made man in nature, but separate from wickedness: the same was perfect God, and the same was perfect man; the same was in nature at once perfect God and man (Against Beron and Helix, Frag VIII). Notice that Hippolytus refers to Mary as all-holy, and ever-virgin. Since he does this in passing, we may be sure that he is introducing no new teaching about Mary, so that it was common to refer to Mary in these terms before Hippolytus wrote. Thus, too, they preached of the advent of God in the flesh to the world, His advent by the spotless and God-bearing Mary in the way of birth and growth, and the manner of His life and conversation with men, … (A Discourse on the End of the World). Here Hippolytus casually refers to Mary as spotless and God-bearing. I assume this latter term is the equivalent to Theotokos in the Greek, which means Bearer of God, commonly translated Mother of God (the Son). This title was that affirmed by the Council of Ephesus. The ancient Christian titles for Mary, Theotokos (“Birth-giver to God”) and Meter Theou (“Mother of God”), are not to be understood in the sense that she somehow created God. Even mothers giving birth to exclusively human children do not create their children. Rather, these titles for the Virgin are an affirmation that the Christ contained in her womb is indeed God, the Theanthropos (“God-man”). She is not his origin nor the source of the Godhead, but she did quite literally give birth to God. If we affirm that Jesus Christ is God, then we must call her Theotokos, for she gave birth to God himself. Nestorius the heretic in the ancient Church refused to call her Theotokos, preferring instead Christotokos, because he could not understand the idea that a creature could give birth to the Creator, yet is this scandal not at the heart of the Incarnation? Nestorius’s doctrines insisted on a separation between the divine Logos and the man Jesus, that somehow the Son of God had inhabited a man, not that God became man as the Christian faith has always held. Is the one who was in her womb God? Then we must call her Theotokos. Though the Orthodox Church does not follow the teachings of the Protestant Reformers, their views regarding the Theotokos’s ever-virginity are a point of commonality with Orthodoxy. Many of the major figures amongst the Protestant fathers in the faith believed in the Theotokos’s ever-virginity. I give an example: taught by the light of faith the Christ was born of a virgin, we know that it is so, that we have no doubt that those who have been unambiguously in error have tried to make a figure of speech of a real virgin, and we pronounce absurd the things that Helvidius and others have invented about perpetual virginity. – Huldrych Zwingli. “Friendly Exegesis, that is, Exposition of the Matter of the Eucharist to Martin Luther, February 1527,” in Selected Writings of Huldrych Zwingli, Volume Two, trans. and ed. by H. Wayne Pipkin, Pickwick Publications, 1984 p.275. Then the pious mind finds wonderful delights in searching for the reasons why the lamb chose to be born of a perpetual virgin, but in this other case it finds nothing but a hopeless horror. [The other case that Zwingli here refers to is the Real Presence] – Huldrych Zwingli. “Subsidiary Essay on the Eucharist, August 1525,” in Selected Writings of Huldrych Zwingli, Volume Two, trans. and ed. by H. Wayne Pipkin, Pickwick Publications, 1984 p.217. A new lie about me is being circulated. I am supposed to have preached and written that Mary, the mother of God, was not a virgin either before or after the birth of Christ, but that she conceived Christ through Joseph and had more children after that. – Martin Luther, “That Jesus Christ Was Born a Jew,” in Luther’s Works, vol. 45, ed. Walther I. Brand, 1962, Muhlenberg Press, p. 199. The form of expression used by Matthew is the common idiom, as if I were to say, ‘Pharaoh believed not Moses, until he was drowned in the Red Sea.’ Here it does not follow that Pharaoh believed later, after he had drowned; on the contrary, it means that he never did believe. Similarly when Matthew says that Joseph did not know Mary carnally until she had brought forth her son, it does not follow that he knew her subsequently; on the contrary, it means that he never did know her. Again, the Red Sea overwhelmed Pharaoh before he got across. Here too, it does not follow that Pharaoh got across later, after the Red Sea had overwhelmed him, but rather that he did not get across at all. In like manner, when Matthew says, ‘She was found to be with child before they came together,’ it does not follow that Mary subsequently lay with Joseph, but rather that she did not lie with him. – Martin Luther, “That Jesus Christ Was Born a Jew,” in Luther’s Works, vol. 45, ed. Walther I. Brand, 1962, Muhlenberg Press, p. 212. Protestants who deny the ever-virginity of the Theotokos are breaking even with their own fathers in faith. The wonderworking “Joy of All Who Sorrow” Icon of the Mother of God was glorified in the year 1688. Euphymia, the sister of Patriarch Joachim (1674-1690), lived at Moscow and suffered from an incurable illness for a long time. One morning during a time of prayer she heard a voice say, “Euphymia! Go to the temple of the Transfiguration of My Son; there you will find an icon called the ‘Joy of All Who Sorrow.’ Have the priest celebrate a Molieben with the blessing of water, and you will receive healing from sickness.” Euphymia did as she was directed by the Most Holy Theotokos, and she was healed. This occurred on October 24, 1688. Help us, O Lady who hast had mercy on us. Hasten, for we perish from a multitude of sins. Turn not thy servants empty away, for we have thee as our only hope. likewise for us who fall down before thee, do thou ask for forgiveness of our sins. Enlighten our hearts with devout purpose and raise thy prayer to thy Son for the salvation of our souls. and a confirmation of the Orthodox Faith. and loose thy suppliants from sins; for thou canst do whatsoever thou dost will. hasten thou, for we are lost in a throng of transgressions; turn not thy servants away with empty hands, for thee alone do we have as our only hope. Apart from thee, O sovereign Lady. And in thee we glory. For we are thy servants. Characterizing with such words the ancient Saints, Vladika John simultaneously summarized his own spiritual attitude which made him one of the greatest Saints of our time. ARCHBISHOP JOHN was born on June 4, 1896, in the village of Adamovka in the province of Kharkov in southern Russia. He was a member of the Little Russian noble family of Maximovitch, to which St. John of Tobolsk also had belonged. He received at baptism the name of Michael, his heavenly protector being the Archangel Michael. He was a sickly child and ate little. He received his secondary education in the Poltava Military School, which he attended from 1907 to 1914. Upon completing military school he entered Kharkov Imperial University in the faculty of law, from which he graduated in 1918, before it was seized by the Soviets. Kharkov, where Vladika spent his formative years, was a true town of Holy Russia, and the young Michael, impressionable to revelations of holiness, acquired there the pattern of his future life. There were two miraculous Icons of the Mother of God, the Oseryanskaya and Eletskaya, which were carried in a religious procession twice a year from the monasteries where they were treasured to the Dormition Cathedral. In the Protection Monastery, in a frescoed grotto underneath the altar, lay the remains of the holy Archbishop Melety Leontovitch, who after his death in 1841 rendered miraculous help to those who served a panikhida for him at his coffin. Even during his lifetime the Archbishop was venerated for his severe asceticism, especially for the ascetic feat of abstaining from sleep. He was known to spend nights on end standing motionless, with lifted arms, deep in prayer. He foreknew the day and the hour of his own death. The young Maximovitch was known to have a veneration for this holy hierarch. Today Archbishop John may be seen to resemble the holy man of Kharkov in at least three respects: he was known not to have slept in a bed for forty years; he knew beforehand of his death; and before his glorification in 1994 his relics rested under a cathedral in a special grave-chapel where panikhidas were sung almost daily and the Psalter read over his coffin by those asking for his help. This is a unique case of the transplanting, as it were, of a part of Holy Russia to contemporary America. While at Kharkov University, Vladika spent more time reading the lives of the saints than attending classes; nonetheless he was an excellent student. Evidently his emulation of saints was apparent even at that age, since Archbishop Anthony of Kharkov, one of the great Church figures of that time (later Metropolitan Anthony Hrapovitsky, the first Chief Hierarch and founder of the Russian Church Abroad) took special pains to become acquainted with him, and then kept the youth close to him and guided his spiritual formation. IN 1921, DURING THE RUSSIAN CIVIL WAR, Vladika, together with his parents, his brothers, and his sister, was evacuated to Belgrade, where he and his brothers entered the University of Belgrade. One brother graduated in the technical faculty and became an engineer, the other graduated in law and served in the Yugoslav police. Vladika himself graduated in 1925 in the faculty of theology. While he was a student he worked for his living by selling newspapers. In 1924 Vladika was ordained reader in the Russian church in Belgrade by Metropolitan Anthony, who continued to exert great influence over him; and Vladika in his turn showed the utmost respect and devotion to his superior. In 1926 Metropolitan Anthony tonsured him a monk and ordained him hierodeacon in the Milkov Monastery, giving him the name John, after Vladika’s own distant relative, Saint John (Maximovitch) of Tobolsk. On November 21 of the same year Vladika was ordained hieromonk. For, indeed, it began to become evident that this was an entirely extraordinary man. It was his own students who first discovered what was perhaps Vladika’s greatest feat of asceticism. They noticed at first that he stayed up long after everyone else had gone to bed; he would go through the dormitories at night and pick up blankets that had fallen down and cover the unsuspecting sleepers, making the Sign of the Cross over them. Finally it was discovered that he scarcely slept at all, and never in a bed, allowing himself only an hour or two each night of uncomfortable rest in a sitting position, or bent over on the floor praying before icons. Years afterward he himself admitted that since taking the monastic vows he had not slept lying in a bed. Such an ascetic practice is a very rare one; and yet it is not unknown to Orthodox tradition. Archbishop Averky of the Jordanville Holy Trinity monastery, then a young hieromonk in Carpatho-Russia, witnessed the deep impression Hieromonk John made upon the seminary students. When they returned home on vacations they would speak of their extraordinary instructor who prayed constantly, served the Divine Liturgy or at least received Holy Communion every day, fasted strictly, never slept lying down, and with true fatherly love inspired them with the high ideals of Christianity and of Holy Russia. In 1934 it was decided to raise Hieromonk John to the rank of bishop. As for Vladika himself, nothing was farther from his mind. A lady who knew him relates how she met him at this time on a streetcar in Belgrade. He told her that he was in town by mistake, having been sent for in place of some other Hieromonk John who was to be consecrated bishop! When she saw him the next day he informed her that the situation was worse than he had thought: it was him they wished to make bishop! When he had protested that this was out of the question, since he had a speech defect and could not enunciate clearly, he had only been told that the Prophet Moses had the same difficulty. The consecration occurred on May 28, 1934. 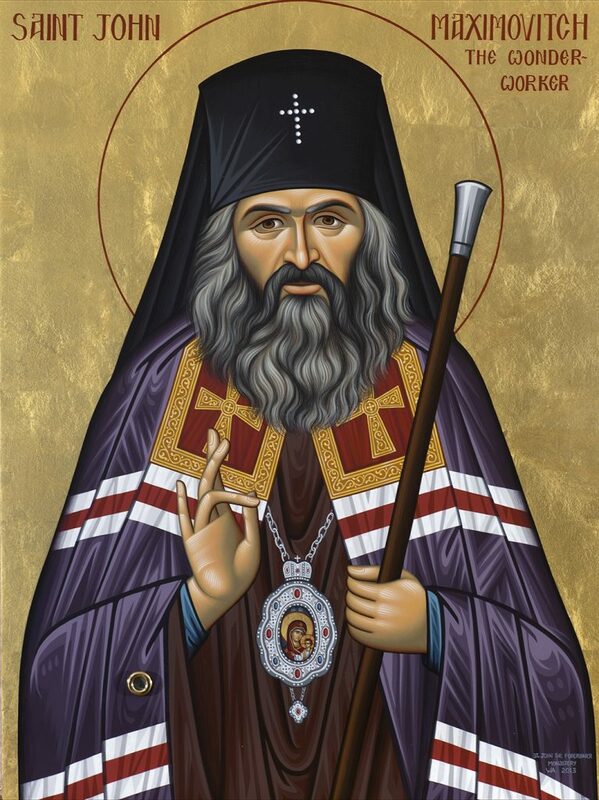 Vladika was the last bishop of the very many to be consecrated by Metropolitan Anthony, and the extraordinarily high esteem in which that venerable hierarch held the new bishop is indicated in a letter which he sent to Archbishop Dimitry in the Far East. Himself declining an invitation to retire to China, he wrote: “Dear friend! I am very old and unable to travel … But in place of myself, as my soul, as my heart, I am sending you Bishop John. This little, frail man, looking almost like a child, is in actuality a miracle of ascetic firmness and strictness in our time of total spiritual enfeeblement.” Vladika was assigned to the Diocese of Shanghai, China. VLADIKA ARRIVED IN SHANGHAI in late November, on the Feast of the Entrance of the Mother of God into the Temple, and found a large cathedral uncompleted and a jurisdictional conflict to resolve. The first thing he did was to restore Church unity. He established contact with Serbs, Greeks, Ukrainians. He paid special attention to religious education and made it a rule to be present at the oral examinations of the catechism classes in all the Orthodox schools in Shanghai. He at once became a protector of various charitable and philanthropic societies and actively participated in their work, especially after seeing the needy circumstances in which the majority of his flock, refugees from the Soviet Union, were placed. He never went visiting for tea to the rich, but he was to be seen wherever there was need, regardless of times and weather. He organized a home for orphans and the children of needy parents, entrusting it to the heavenly protection of a Saint he highly venerated, St. Tikhon of Zadonsk, who loved children. Vladika himself gathered sick and starving children off the streets and dark alleys of Shanghai’s slums. Beginning with eight children, the orphanage later housed up to a hundred children at one time, and some 1500 in all. When the Communists came, Vladika evacuated the whole orphanage, first to an island in the Philippines, and then to America. It soon became apparent to his new flock that Vladika was a great ascetic. The core of his asceticism was prayer and fasting. He ate once a day at 11 p.m. During the first and last weeks of Lent he did not eat at all, and for the rest of this and the Christmas fast he ate only bread from the altar. His nights he spent usually in prayer, and when he finally became exhausted he would put his head on the floor and steal a few hours of sleep near dawn. When the time would come to serve Matins, someone would knock on the door, to no avail; they would open the door and find Vladika huddled on the floor in the icon-corner, overcome by sleep. At a tap on the shoulder he would jump up, and in a few minutes he would be in church for services — cold water streaming down his beard, but quite awake. A similar event occured in 1939, when certain parishioner began to lose her faith due to many tribulations which had befallen her. Once, upon entering the Church during Vladika’s service, she witnessed during the transubstantiation of the Holy Sacraments a little flame in the form of a large tulip descended into the Chalice. After this miracle her faith returned, and she began repenting of her faint-heartedness. Vladika visited prisons and celebrated the Divine Liturgy for the convicts. On one occasion in Shanghai, Vladika John was asked to give communion to a dying man in a Russian hospital. This time he took another priest with him. On his arrival he spotted a gregarious young man in his twenties, playing a harmonica. This lad was to be discharged the next day. Vladika John called to him and said: “I want to give you communion right now.” The young man immediately confessed his sins and received communion. The astonished priest asked Vladika why he did not go to the one dying, but tarried instead with an obviously healthy young man. Vladika answered: “He will die tonight, and the other, who is seriously ill, will live many years.” It happened just as he foretold. Vladika loved to visit the sick and did it every single day, hearing confessions and giving Holy Communion. If the condition of a patient should become critical, Vladika would go to him at any hour of the day or night to pray at his bedside. Here is one undoubted miracle among the many worked by Vladika’s prayers; it was recorded and placed in the archives of the County Hospital in Shanghai. L. D. Sadkovskaya was very much taken by the sport of horse racing. Once she was thrown off her horse; she hit her head on a rock and lost consciousness. She was brought to the hospital unconscious. A concilium of doctors agreed that her condition was hopeless and it was not likely that she would live until morning. The pulse was almost gone; the skull was fractured in places so that small pieces of the skull were pressing on the brain. In such a condition she would die on the operating table. Even if her heart would tolerate surgery and the result were successful, she would still remain deaf, dumb, and blind. Her sister, after hearing all this, rushed to Bishop John in despair and begged him to save her sister. Vladika agreed. He came to the hospital and asked everyone to leave the room and prayed there for about two hours. Then he called the chief doctor and asked him to examine her again. How surprised the doctor was to discover that her pulse was normal! He agreed to perform the operation immediately, but only in the presence of Bishop John. The operation was successful, and the doctors were amazed when, after the operation, the patient regained consciousness and asked to drink. Soon she was released from the hospital and lived for many years a normal life. Vladika visited the prison also, and celebrated the Divine Liturgy for the convicts on a primitive little table. But the most difficult task for a pastor is to visit the mentally ill and the possessed — and Vladika sharply distinguished between the two. Outside Shanghai there was a mental hospital, and Vladika alone had the spiritual power to visit these terribly sick people. He gave them Holy Communion, and they, surprisingly, received it peacefully and listened to him. They always looked forward to his visits and met him with joy. Vladika possessed great courage. During the Japanese occupation the Japanese authorities tried in every way possible to bend the Russian colony to their will. Pressure was directed through the heads of the Russian Emigrant Committee. Two presidents of this Committee strove to maintain its independence, and as a result both were killed. Confusion and terror seized the Russian colony, and at that moment Vladika John, in spite of warnings from the Russians who were collaborating with the Japanese, declared himself the temporary head of the Russian colony. During the Japanese occupation it was extremely dangerous to walk on the streets at night, and most people took care to be home by dark. Vladika, however, paying no heed to the danger, continued to visit the sick and needy at any hour of the night, and he was never touched. In Shanghai, a voice teacher, Anna Petrovna Lushnikova, taught Vladika the proper method of breathing and pronunciation of words, thus helping him to better his diction. At the end of each lesson Vladika paid her 20 dollars. In 1945, during the war, she was gravely wounded and chanced to be in a French hospital. On a very stormy night, feeling that she might die, Anna Petrovna began asking the nurses to call Vladika John, who was in France, so that he would give her communion. The nurses refused since the hospital was locked up during the night due to war-time conditions. Anna Petrovna was beside herself and kept calling upon Vladika. Suddenly, around eleven o’clock in the evening, Vladika appeared in the ward. Unable to believe her eyes, Anna Petrovna asked Vladika, weather this was a dream or did he really come to her. Vladika smiled, prayed and administered communion to her. Following this she calmed down and slept. The next morning she felt cured. No one believed Anna Petrovna that Vladika visited her that night since the hospital was tightly secured. However, her ward neighbor substantiated the fact that she also saw Vladika. The greatest surprise was that under Anna Petrovna’s pillow was found a 20 dollar bill. Thus Vladika left a material evidence of his visit. With the coming of the Communists, the Russians in China were forced once again to flee, most of them through the Philippine Islands. In 1949 approximately 5000 refugees from the Chinese mainland were living in an International Refugee Organization camp on the island of Tubabao in the Philippines. This island is located in the path of the seasonal typhoons which sweep through that part of the Pacific. During the 27-month period of the camp’ s occupancy, the island was threatened only once by a typhoon, and it changed course and bypassed the island. When the fear of typhoons was mentioned by one Russian to the Filipinos, they replied that there was no reason to worry, because “your holy man blesses your camp from four directions every night.” They referred to Vladika John; for no typhoon struck the island while he was there. After the camp had been almost totally evacuated and the people resettled elsewhere (mainly in the USA and Australia), it was struck by a terrible typhoon that totally destroyed the camp. VLADIKA HIMSELF went to Washington, D. C., to get his people to America. Legislation was changed and almost the whole camp came to the New World — thanks again to Vladika. The exodus of his flock from China accomplished, Archbishop John was given in 1951 a new field for his pastoral endeavor: he was sent by the Synod of Bishops to the Archdiocese of Western Europe, with his see first in Paris, and later in Brussels. He was now one of the leading hierarchs of the Russian Church, and his attendance was frequently required at the sessions of the Synod in New York City. In Western Europe Vladika took a deep interest not only in the Russians in the diaspora, for whom he exerted himself tirelessly in labors similar to those for which he had been known in Shanghai, but also in the local inhabitants. He received under his jurisdiction local Dutch and French Orthodox Churches, protecting them and encouraging their Orthodox development. He celebrated the Divine Liturgy in Dutch and French, as before he had served in Greek and Chinese, and as later he was to serve in English. Vladika’s interest in and devotion to the Church’s Saints, of whom his knowledge was already seemingly limitless, was extended now to Western European Saints dating from before the schism of the Latin Church, many of whom, venerated only locally, were included in no Orthodox calendar of Saints. He collected their lives and images of them, and later submitted a long list of them to the Synod. IN SAN FRANCISCO, WHOSE cathedral parish is the largest in the Russian Church Abroad, a life-long friend of Vladika, Archbishop Tikhon, retired because of ill-health, and in his absence the construction of a great new cathedral came to a halt as a bitter dispute paralyzed the Russian community. In response to the urgent request of thousands of Russians in San Francisco who had known him in Shanghai, Archbishop John was sent by the Synod in 1962 as the only hierarch likely to restore peace in the divided community. He arrived at his last assignment as bishop twenty-eight years to the day after his first arrival in Shanghai: on the feast of the Entrance of the Mother of God into the Temple, November 21, 1962. Under Vladika’s guidance a measure of peace was restored, the paralysis of the community was ended, and the cathedral finished. Yet even in the role of peacemaker Vladika was attacked, and accusations and slanders were heaped upon his head. He was forced to appear in public court — in flagrant violation of church canons — to answer to preposterous charges of concealing financial dishonesty by the Parish Council. All involved were completely exonerated; but thus Vladika’s last years were filled with the bitterness of slander and persecution, to which he unfailingly replied without complaint, without judging anyone, with undisturbed peacefulness. Vladika remained true to the end to his path of faithful service to the Church. To those who knew him in his last years perhaps two aspects of his character stood out. First was his strictness in what regarded the Church and the Law of God. At the end of October the Roman Catholic Church celebrates the feast of All Saints. There is a tradition that during the preceding night the dark spirits celebrated their own festival of disorder. In America this “celebration” called Halloween has become an occasion on which children make mischief dressed in costumes of witches, devils, ghosts, as if calling on the dark powers — a diabolic mockery of Christianity. A group of Russians organized on this night a Halloween Ball. In the San Francisco Cathedral at this time was the All-night Vigil celebrated, and a number of people were absent, to the great sorrow of Vladika. After the service Vladika went to the place where the ball was still in progress. He climbed the steps and entered the hall, to the absolute astonishment of the participants. The music stopped and Vladika, in complete silence, glared at the dumbfounded people, slowly and deliberately making the round of the entire hall, staff in hand. He spoke not a word, and none was necessary; the mere sight of Vladika stung the conscience of all, as was evident from the general consternation. Vladika left in silence; and the next day in church he thundered his holy indignation and his flaming zeal calling all to the devout Christian life. Yet Vladika is not best remembered by his flock for his sternness, but rather for his gentleness, his joyfulness, even for what is known as “foolishness for Christ’s sake.” The most popular photograph of him captures something of this aspect of his character. It was especially noticeable in his conduct with children. After services he would smile and joke with the boys who served with him, playfully knocking the refractory on the head with his staff. Occasionally the Cathedral clergy would be disconcerted to see Vladika, in the middle of a service (though never in the altar), bend over to play with a small child! And on feast days when blessing with holy water was called for, he would sprinkle the faithful, not on the top of the head as is usual, but right in the face (which once led a small girl to exclaim, “he squirts you”), with a noticeable glint in his eye and total unconcern at the discomfiture of some of the more dignified. Children were absolutely devoted to him, despite his usual strictness with them. Vladika’s life was governed by the standards of the spiritual life, and if this upset the routine order of things it was in order to jolt people out of their spiritual inertia and remind them that there is a higher judgment than the world’s. A remarkable incident from Vladika’s years in San Francisco (1963) illustrates several aspects of his holiness: his spiritual boldness based on absolute faith; his ability to see the future and to overcome by his spiritual sight the bounds of space; and the power of his prayer, which beyond all doubt worked miracles. The incident is related by the woman who witnessed it, Mrs. L. Liu; the exact words of Vladika were confirmed by the Mr. T. who is mentioned. AMONG THOSE WHO KNEW and loved Vladika, the first response to the news of his sudden death was: it cannot be! And this was more than a reaction to the suddenness of the event; for among those who were close to him there had unaccountably developed the notion that this pillar of the Church, this holy man who was always accessible to his flock — would never cease to be! There would never be a time when one would not be able to turn to him for advice and consolation! In one sense, in a spiritual sense, this has since turned out to be true. But it is also one of the realities of this world that every man who lives must die. Vladika was prepared for this reality. 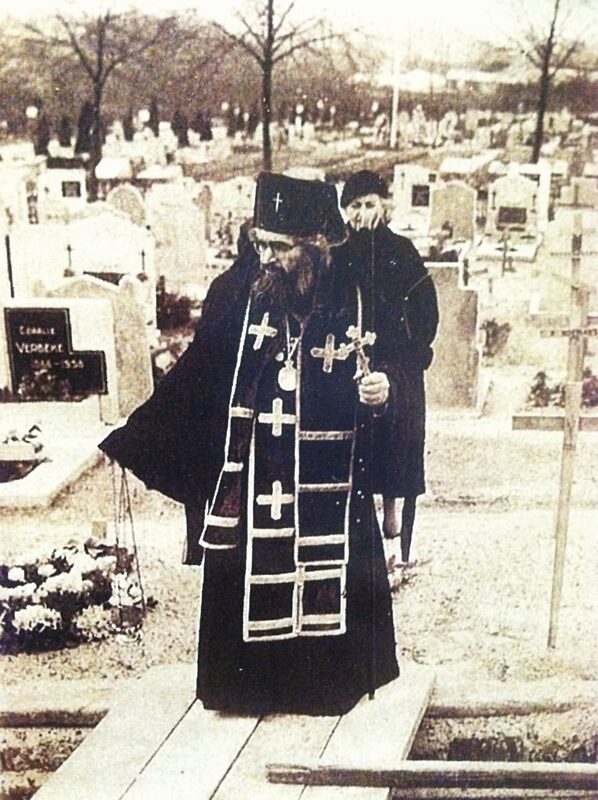 Again, on the evening before his departure for Seattle, four days before his death, Vladika astonished a man for whom he had just served a moleben with the words, “You will not kiss my hand again.” And on the day of his death, at the conclusion of the Divine Liturgy which he celebrated, he spent three hours in the altar praying, emerging not long before his death, which occurred on July 2, 1966. He died in his room in the parish building next to the church. He was heard to fall and, having been placed in a chair by those who ran to help him, breathed his last peacefully and with little evident pain, in the presence of the miracle-working Kursk Icon of the Sign. Later, before the end of the forty-day period, Fr. Constantine Z., long Vladika’ s deacon and now a priest, who had lately been angry at Vladika and had begun to doubt his righteousness, saw Vladika in a dream all in light, with rays of light shining around his head so brightly that it was impossible to look at them. Thus were Fr. Constantine’s doubts of Vladika’s holiness dispelled.